I’m in the process of reading a number of applications for a position at MPOW. I am, again, surprised by some of what I’m reading. And seeing. So, a few thoughts for those of you who might be on the job hunt…. Headers are handy. If you’re applying for a position and there is a lot of competition, it’s nice to be able to see, at a glance, whose resume and cover letter you’re reading. That being said, don’t be too cute. I’m probably printing this on my black and white printer, so funky fonts in funky colors are probably going to be lost. And difficult to read. Learn the proper form for a formal letter. Google it, for crying out loud. You’re not writing a note to a buddy or sending a text message. Don’t tell me how detail-oriented you are and then misspell something. Spell check is your friend. Take the time to find out who you’re writing the letter to, instead of resorting to the “Dear Sir or Madam.” Or certainly instead of not using a salutation at all. You really don’t need a six page resume. Seriously. Make sure your formatting isn’t too unusual, since it will show up weirdly on my end and I’ll end up losing what could be pertinent information. Clean and crisp is the best bet. I know the search is hard out there. Good luck to you, if you’re looking. In the meantime, take a look at what you’re sending out and make sure that it’s the best representation of you, since it’s usually the first chance a potential employer has to find out about you. It’s an old adage, but put your best foot forward. It’s been an interesting few weeks at our house. DH lost his job a while back, due to the kind of downsizing that’s going on all over the country. He’s been diligently looking for a new job, and I’m pleased to share that he’s now the Director of IT for a great company. He starts Monday. DH, of course, is a tech-savvy guy and has our house set up with a wireless network and has about a zillion devices with which he can access the internet. The job search has been primarily online, and there are many job boards and social networks that have job postings. Once you’ve found a job that you’re interested in, applying for that job is online. There may be a form, which according to DH sometimes takes hours to complete. Occasionally, there’s the simple email and resume approach. In either case, the computer time needed is substantial. If you’re a person that is looking for a job and either doesn’t have internet access or has very slow dial-up access, you’re probably doing your job hunting at the local public library. And if you’re the local public library, you probably have a time limit on your public access computers. According to DH, 30 minutes is not nearly enough time. Given the current economic times, perhaps it’s time to extend the time limit on computers at our public libraries. I understand that there’s frequently a line of folks wanting access, but there is a significant group of people that aren’t using the computers to play games or check on their Facebook pages. Another approach would be to set aside some computers specifically for job searchers. We should be addressing the issues that our patrons are facing and try to help them as much as possible. We may need to help those without strong computer skills navigate the morass that is a job search site, or help them apply for a position. Maybe it’s just the access itself. Maybe it’s assistance in developing a resume. Or establishing an email address. Give some thought to your computer access and your IT assistance. We can help. We should help. It may be difficult to devote resources, but it’s precisely these sorts of services that make libraries a unique and valuable community treasure. Hopefully, people will remember that assistance when it comes time to vote for library issues. Regardless, it’s the right thing to do. Review how you’re addressing this. It’s more important now than ever. It’s Flag Day today, and frankly, I had completely forgotten. It seems that we don’t celebrate these things any more, or even remember them. We should. A few years ago, DBF took me to see Fort McHenry, in Baltimore. 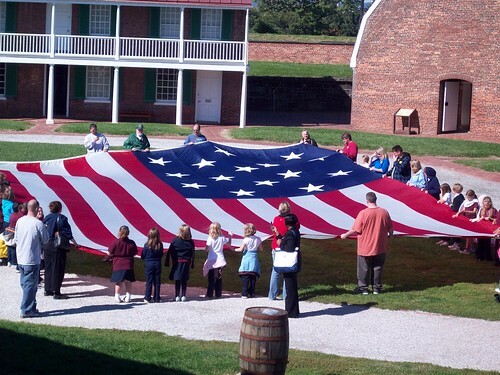 Fort McHenry is, of course, the place where Francis Scott Key wrote the words that would become our national anthem. There is a stirring movie presentation that describes the events of that night, and at the end, the Navy choir sings the national anthem. The curtain opens….and there is the biggest flag you’ve ever seen, flying majestically in the breeze. There wasn’t a dry eye in the house. A couple of years ago, I took DH to Fort McHenry to experience the pride and patriotism that I felt when I had visited. The visitor’s center had been remodeled and improved, but there was still the curtained room with the film. The curtain opened….and there was a flag. Turns out, it was too windy to fly the monster flag. The thing is enormous – 30×42 feet. If there is a stiff breeze, it will snap the flag pole. Luckily, there was a school tour there that day, and a park ranger was giving the kids a tour. He brought out a dufflebag that contained the monster flag. They opened it up in the middle of the fort, and it was an impressive sight. DH reports that it was heavy, too. If you haven’t had the chance to visit Fort McHenry, do so. And wave that flag. A million years ago, as a college senior at the University of Wisconsin in Milwaukee, I did a project in a statistical history class. We used the university’s mainframe computer and punch cards (a whole other post) to analyze data from some historical records of early American colonists. Now, Germany has discovered a treasure-trove. I’m envious. Filed under Me and mine, Things that make you go, "Hmmm..."